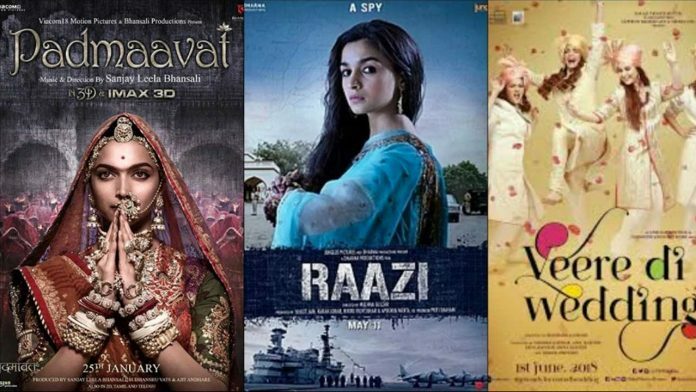 2018 has been an eventful year with female-centric films dominating the Bollywood box office. With Deepika Padukone’s Padmavaat, Alia Bhatt’s Raazi, Veere Di Wedding and Shraddha Kapoor’s Stree, more and more mainstream Bollywood films are boasting strong female lead characters. Padmaavat where Deepika Padukone’s eponymous character is a self-assured queen who, though famed for her beauty, commands attention to her knowledge, intellect, courage, and decisiveness. 2018’s Raazi with Alia Bhatt in the lead is the latest film to join the ‘female-centric’ brigade. Its strength lies in how it replaces the decades-old ‘male hero’ with a ‘heroine’ that is equally formidable. Veere Di Wedding also seems to be a shot in the arm for women-centric films. Headlined by four female leads, the film is supposed to be an upbeat girl gang comedy exploring the lives of four women (Kareena Kapoor, Sonam Kapoor, Swara Bhaskar and Shikha Talsania) and how they deal with the trials and tribulations of modern life. Stree, the horror-comedy starring Shraddha Kapoor impressively left an understated message about respecting women, without losing out on entertainment quotient. Striking a chord with the audience as the titular character, Shraddha Kapoor has won accolades for her unique character and apt portrayal of Stree. Rani Mukerji’s Hichki, which hit the theatres in March, subverted the idea that female actors are not meant to do just supporting roles once they cross a certain age. Previous articleThe Makers Of Zero Unveil The Making Video Of ‘Husn Parcham’!